Anger against the state is palpable, and with the rising cost of goods and a drawn-out cash shortage, there could be more civil unrest ahead for the southern African nation. A police truck drives past a thick cloud of smoke as protesters burn tires in Bulawayo, Zimbabwe, during a tense, three-day nationwide protest against a fuel price hike in January. Human rights groups in Zimbabwe estimate that security agents have killed more than a dozen Zimbabweans and wounded and arrested hundreds more in a sweeping crackdown after three days of protests and labor strikes against a fuel price hike last month. The protests have subsided, but Zimbabwe’s problems are still spiraling. Anger against the state is palpable, and with the rising cost of goods and a drawn-out cash shortage, there could be more civil unrest ahead for the southern African nation of about 16.5 million. At the heart of Zimbabwe’s problems are a failing economy and the opposition’s continued challenge to President Emmerson Mnangagwa’s legitimacy. He narrowly won the presidential election last July, promising to deliver economic reforms and democratic freedom after almost four decades of Robert Mugabe’s oppressive rule. But critics say the new administration has so far failed to resolve the economic woes it inherited, and its security forces have launched brutal repression of the public. One reform triggered major upheaval. On Jan. 12, President Mnangagwa announced a 150 percent increase of the price of gas, saying it was needed to secure the nation’s fuel supply. That angered citizens already struggling with annual inflation estimated at more than 235 percent, according to Steve Hanke, an economist at Johns Hopkins University. Activists and labor unions called for a national shutdown and, on Jan. 14, Zimbabweans responded: shops and businesses closed, workers stayed away from work and students stayed out of school across the country. Protesters put stones and makeshift barricades in the streets to stop traffic. Within hours, demonstrations escalated into violence, as police tried to disperse the crowds with tear gas. Angered by the police clampdown, people broke into stores thought to be linked to members of the ruling party, the Zimbabwe African National Union-Patriotic Front. The looting spread from one neighborhood to another. The state responded to the three-day chaos with nighttime house raids by security forces. Henry Dube, a 54-year-old entrepreneur, was grazed by a bullet, tear-gassed and described being beaten by security forces the day the anti-fuel price protests began. He said the government was behaving like a military dictatorship. “The people who lead us are dictators, they rule by command and everything a soldier does is by command and order,” he told NPR. In a series of tweets, Mnangagwa said that “violence or misconduct by our security forces is unacceptable” and warned that “heads will roll” in the ranks if they acted wrongly. But he later dismissed condemnation of the security agents’ crackdown and said the use of force was justified to stop protesters from looting and destroying property. The leader quickly returned from a foreign investment trip — and skipped the annual World Economic Forum in Davos, Switzerland — to deal with the unrest. On Wednesday, the president called for a national dialogue with his opponents, but the leading opposition party, the Movement for Democratic Change Alliance, rejected the invitation. In a statement, the party listed “minimum conditions” the administration should fulfill for talks to begin, such as releasing jailed activists and protesters and disclosing the real number of civilians killed during and following the unrest. Local human rights groups allege as many as 17 people have been killed, while police put the number at three. Yet many Zimbabweans are skeptical about prospects for fair dialogue. “The government doesn’t seem to understand dialogue. That’s why people have resorted to strikes. This situation will never be OK unless there is dialogue,” said Dube. Piers Pigou, a senior consultant for southern Africa at the International Crisis Group, believes dialogue between the government and opposition could be a way forward, but without clear demonstration of goodwill from Mnangagwa toward activists in jail and in hiding, there is little hope for resolution. 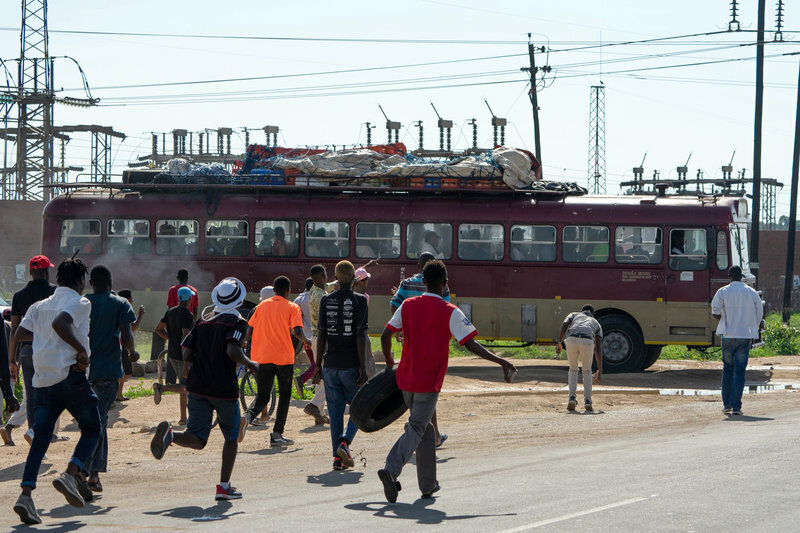 Protesters throw stones toward a bus that was alleged to be working during the national strike against the steep rise in fuel prices in January in Emakhandeni township, Bulawayo, Zimbabwe. Pigou expects neighboring South Africa could help mediate in the predicament, as it has in Zimbabwe’s past crises. Many, including South African opposition parties, are irked that President Cyril Ramaphosa has not spoken out on the issue. Shops, banks and factories reopened after the three-day shutdown late last month, but basic goods such as bread, cooking oil and medicines are costly and in short supply. Meanwhile, armed soldiers and police have set up security checkpoints in cities and are sometimes deployed to gas stations to maintain order in the long lines. Reports of alleged security abuse continue in the low-income areas of Harare and the city of Bulawayo. As Zimbabwe sinks deeper into economic crisis, the prospect of more protests against the government’s austerity measures is strong, which could lead to more government crackdowns. This week, Mnangwaga reportedly accused Western powers, including the United States, of stoking opposition and unrest in Zimbabwe. The U.S. has routinely urged Zimbabwe to implement democratic reforms, as a condition to dropping targeted sanctions against the government. 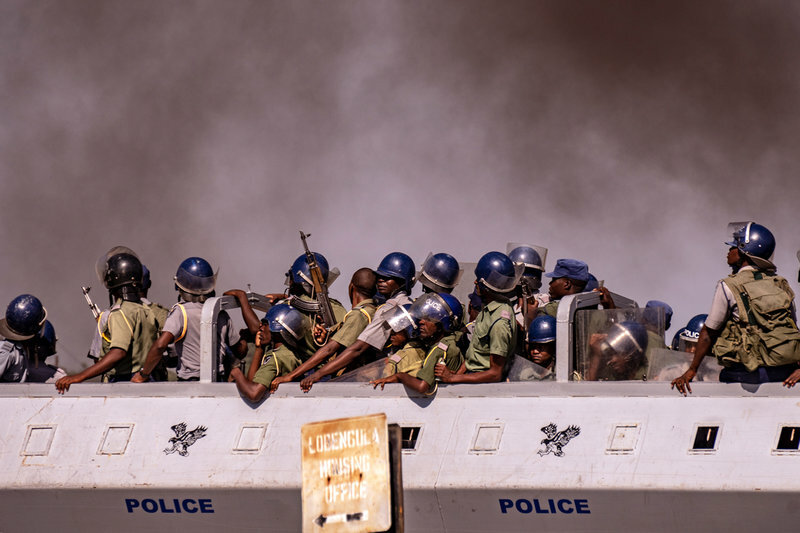 Zimbabwe has been slow to change a 2002 public safety law the leadership has often used to empower the police and the military to crush revolts. On Aug. 1, 2018, soldiers fired live rounds at demonstrators in the capital who were protesting against delays in announcing the presidential election. At least six people were killed and 23 injured, according to a commission set up to investigate the incident. Mnangagwa would need to take swifter measures toward meaningful political dialogue, pass effective economic reform and rein in the security forces, analysts say, to stop tensions between the public and the state from boiling over once again. Journalist Tendai Marima reported from Bulawayo, Zimbabwe.